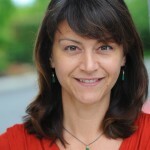 This is a guest post by Rebecca F Reuter – Fisheries Scientist/Communications Specialist fo NOAA Alaska Fisheries Science Center. As a fisheries scientist I have found it challenging to overcome misconceptions about what is sustainable seafood. For years I would give presentations about my science and talk about why the science I conduct is part of the process of ensuring sustainable fisheries in the U.S. But I knew I wasn’t connecting with my audience when the first question I would get would be “What is a fishery?” I always thought that if I explained what a fishery was that my audience would have a better understanding about the importance of my work. Then one day I had an “aha moment.” After several years as a fishery scientist and several years after the sustainable seafood movement began, I realized that I was not only part of the seafood industry but part of the process to ensure that seafood is harvested in a sustainable manner. By just replacing the word “fisheries” with “seafood,” I was now able to communicate the importance of my research to the public by engaging them through their connection with seafood. I think there is confusion about what is sustainable seafood because consumers don’t understand how seafood gets to the marketplace. In the U.S. the Magnuson-Stevens Fishery Conservation and Management Act is the principle law governing the catch of U.S. seafood. This law mandates that NOAA Fisheries limit the amount of fish caught to prevent or end overfishing in waters between 3 and 200 miles off our coasts. In the U.S., responsible management of seafood is a challenging balancing act. 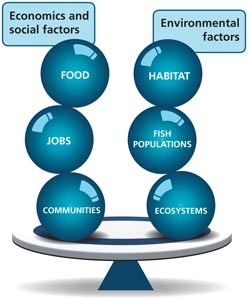 Factors like the need for jobs and healthy food are considered as well as ensuring sustainable fish populations and ecosystems. Fortunately, there is a process that brings in a team of people such as scientists, fishermen, and resource managers to work together in what are called Fishery Management Councils. At Council meetings scientists give their recommendation for a harvest limit and then others can discuss whether that number should be lowered based on economic, social or environmental factors. If any one of these things is out of balance, then that seafood could be considered unsustainable. For a fishery scientist, our goal is to determine the amount of fish to harvest that does little to no harm to the environment and that leaves enough fish in the water for the population to renew itself. 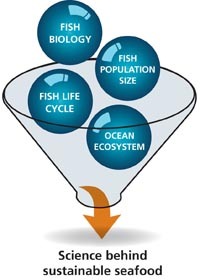 This takes many different types of scientists: A mathematician will work on estimating fish population size; a biologist will find out things like how old a fish gets, or how many eggs survive to adulthood during a fish’s life cycle and a group of scientists including oceanographers, work together to determine what influences an ecosystem. All this scientific information is considered by the Council, plus economic and social impacts, when making their management recommendations to NOAA Fisheries. The final management specifications are then sent to the Secretary of Commerce by NOAA Fisheries for approval and made into regulations. I think if more people understood this process, their trip to the market or selection from a menu would be simplified. Buying U.S. caught seafood, is buying healthy and sustainable seafood, plus you are supporting local fishermen. 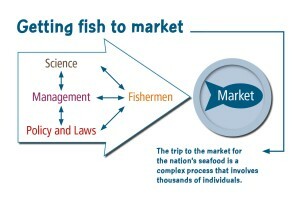 Learn more about sustainable U.S. seafood at www.fishwatch.gov. 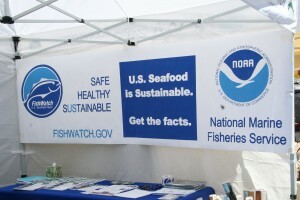 Getting the word out about sustainable U.S. seafood at the Ballard Seafood Festival in Seattle WA.